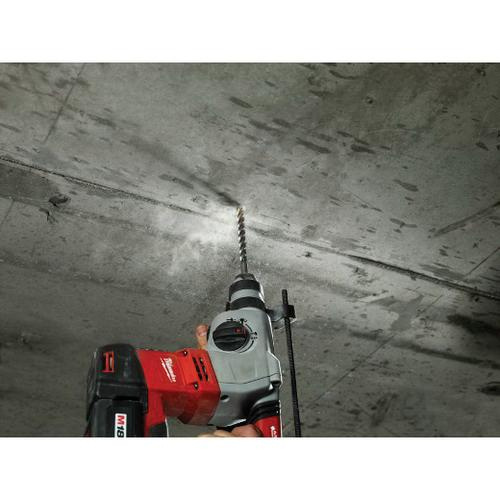 Milwaukee Tool MX4™ 4-Cutter rotary hammer drill bit with 25/64-Inch SDS-Plus shank, is ideal for spot drilling. It has spiral flute with four 90-degree point to drill and remove drilled out material. It measures 12-Inch x 3/8-Inch Dia. This drill bit features solid carbide construction and provides drilling depth of 10-inches. The reinforced flute of this drill bit reduces vibration and offers maximum durability. It features wear mark indicators to show end of life. It features breaker points lead to ensure faster drilling speed. The enhanced rebar guards of this drill bit offers long lasting durability. The centering point of this bit ensures correct hole placement. Drill bit meets ANSI standards.